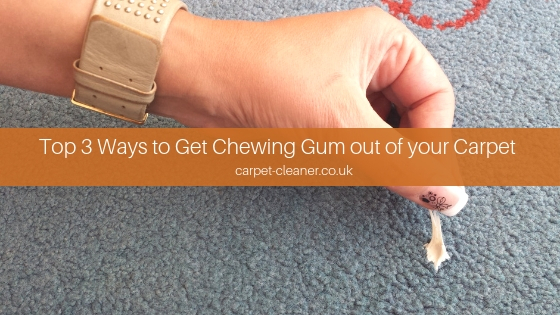 Getting chewing gum off your carpet might be one of the most annoying tasks in the world. And, after addressing the issue some years back in a blog post, which got quite a bit of traction, we’ve decided to give you an update. This article will not only expand upon our previous technique but will also show an entirely new method for cleaning chewing gum off your carpet, as well as a quick and easy way to get rid of any leftover residue. Fill the bag with the ice cubes and tie it together carefully – you don’t want those slippery cubes escaping! Then, rub the bag over the gum and keep it there for a bit. The cold will solidify the gum, making it easy to scrape away. Give it a couple of minutes and get to rubbing – it will come right off! Just remember to immediately throw away any removed pieces, unless you feel like repeating the whole ordeal. Here’s the thing about DIY carpet cleaning (and home cleaning in general) – if you want to avoid using expensive, and often – toxic – commercial cleaning products, you need to get crafty. And this means using every trick in the book. For this method, we’ll be recruiting the help of your trusty hairdryer. It’s really easy and works just as well as the ice cube method. This method works in the exact opposite way of the ice-cube carpet cleaning trick – instead of freezing the chewing gum, you’ll be heating it. A word of caution here – whenever you’re cleaning things around your home, garage or garden, you always want your skin to be protected. Regardless of whether you’re using commercial cleaning products or not, you want to avoid touching things with bare hands. Always use gloves. So, slap on your gloves and get to work. Using your hairdryer, carefully heat the chewing gum, while taking care not to burn the carpet fibres. As you work, you’ll notice the gum softening up. Once it mellows enough, pull it away from your carpet, toss it into the trash bin, and you’re done. A bit of (unsweetened) peanut butter – yes, it works. Before you begin, take a minute to mix your dish soap with the water and pour it into the spray bottle. Apply your lubricant of choice to the problematic area. Gently rub and roll the carpet fibres between your fingers to get the last bits of gum ready for removal. Then, grab one of the cloths and either blot or carefully pull the pieces out (if you choose to pull, do it very lightly). You can also use your fingernails to scrape at the bits. After you’ve removed all visible bits of chewing gum, spray the area with your concoction and blot it out with a clean cloth. Repeat as necessary, until your carpet is clean. Follow up by thoroughly rinsing with clean cloth and fresh water. Finally, use your last cloth to remove any excess moisture and do a quick vacuuming session for good measure. If you find yourself in a situation where the chewing gum refuses to let go, then it’s time to get some professional help – the experts of Carpet Cleaner Ltd is always a mere phone call away!